Prof Morandotti’s group demonstrated the possibility of harnessing polarization for communication and quantum optics with integrated chips. Experimental set-up of the hybrid self-locked and external pumping scheme. The arrow on top of the amplifier represents the propagation direction of the light inside the cavity. The coloured spheres with arrows illustrate the frequency and polarization of the involved fields. Our research group demonstrated a new setup capable of exploiting the degree of freedom offered by polarization in an integrated device. This compact microring resonator fetures frequency mixing between orthogonal polarization modes, acting as an optical parametric oscillator (OPO). 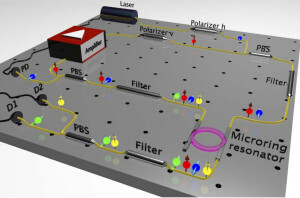 Operating the device above and below threshold, we directly generate orthogonally polarized beams, as well as photon pairs, respectively, that can find applications in optical communication and quantum optics, with all the benefits inherent to CMOS compatible integrated devices.